Details: New York style cheesecake bought from Safeway. Class V Stout is brewed by Kern River Brewing Company in Kernville, California. Kern River Brewing describes this beer as “an Oatmeal Stout, Milk Stout and an Imperial Stout all in one.” They also advertise that this beer is “not for the timid” and named it after the most difficult level river rapid that can be negotiated, the numeral V.
The Class V Stout certainly has a very complex flavor profile. You can taste a hint of chocolate and some coffee flavors. It wasn’t bad but it did have a bit of an undesirable bitter coffee bite to the aftertaste. The cheesecake was awesome. It was just a plain old New York style cheesecake, very simple yet delicious. The big question is: how was the beer with the food? The answer is: good. 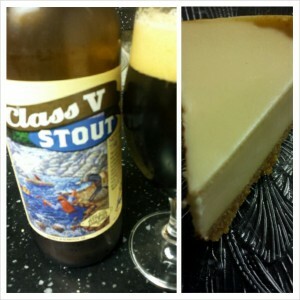 The sweet and creamy cheesecake really smoothed out the flavor profile of the stout. It removed the bitter aftertaste and rounded out all of the complex corners of the beer. This is a pairing well worth trying.